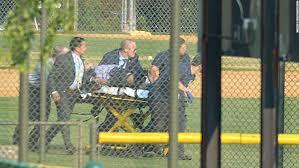 Political violence on the diamond. Photo: CNN. No group has a monopoly on political hatred, but most would agree that hate groups and violent individual incidents occur more frequently on the right than the left. In fact there was surprise expressed at Hodgkinson’s political views, since anti-Republican violence is somewhat unusual. Not that Hodgkinson was any sort of political activist—he seems to have been a disturbed individual and a domestic abuser with little political involvement at all, apart from his comments on social media. But political hatred is alluring these days, whether one has a troubled background or not. This kind of hatred can be enticing. It’s like a drug that intensifies emotion and makes colors pop. For people leading uneventful, ordinary lives, it can add a jolt of excitement. For the increasingly large number of people whose lives are stressed daily, political hatred provides an outlet, a target, a scapegoat. I can empathize and I suspect you can, too. We’re all flawed human beings, to be sure, but how can those people believe in such utterly destructive nonsense? How can they behave as they do? What hypocrites! What heartless, self-serving bastards! 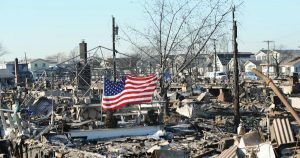 Look what they’ve done to America’s economy/education/healthcare/infrastructure/politics! Can these divisions be bridged? I doubt it. It seems likelier that incidents like the one in Alexandria will only increase, with “partisans” from both sides doing the shooting. And each new outrage will only harden the hatred. It would be helpful if the country could fully acknowledge this, if only to begin the process of constructing a solution. Increasingly, that solution seems to be that we will go our separate ways, either violently and chaotically, as at present, or formally and permanently with a political solution that codifies our divide in a way that makes sense. Trump. Comey. Russia. All very important, yes, but also very exhausting to focus on exclusively. The mess in Washington is serious indeed but like all of our endeavors, it stems from the mysterious processes that govern human behavior. Granted, compulsive tweeting is a relatively new manifestation of troubled conduct. Still, it can sometimes help to examine behavioral patterns from another angle. The Dinner Party by Joshua Ferris. The writer Joshua Ferris is a case in point. He has an excellent grasp of the tragicomic nuances that underlie all our behavior, especially in intimate relationships, and The Dinner Party, his new book of short stories, may be a helpful distraction from the current news. Although there aren’t any direct political references to our present situation, the book may still help to put things in perspective. 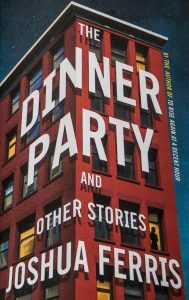 The Dinner Party is Ferris’s first short story collection and it continues the rather bleak existential outlook, leavened with flashes of humor, found in the novels. Some reviewers have savaged the book but the majority of reviews have been very positive. The stories vary somewhat in quality—stories in collections invariably do—but the best of them are very strong indeed. These include the title story, a devastating portrait of a disintegrating marriage and also the consequences of failing to know oneself, “A Night Out,” which deals with male infidelity, and “Fragments,” which counters with the female version. The last story in the collection, “A Fair Price,” does have some direct relevance to America’s current social inequities. It concerns a clueless, self-involved privileged character and the day laborer he hires to help empty out a storage unit. The consequences of their interaction certainly gave me pause. I think Joshua Ferris, only in his early forties, is one of the best writers currently working in America. If you’d like an extra helping of insight into the way a certain class of Americans (educated, liberal, urban) lives today, I wholeheartedly recommend The Dinner Party.